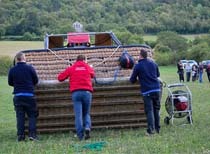 It is here in Burgundy that France Montgolfières Balloon Company was created more than 30 years ago. This wonderful area renowned for its gastronomic delights, its fine wines and chateaux, Burgundy gives every visitor a taste of the soul of France. 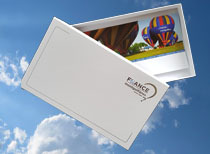 More than 25 years ago France Montgolfières Balloon Company was created here in Burgundy. This wonderful area renowned for its gastronomic delights, its fine wines and chateaux, Burgundy gives every visitor a taste of the French soul. Beaune is also a renowned town of Art and History, it's most emblematic monument recognisable by it's varnished tiles is the Hôtel Dieu also known as the "Hospices de Beaune". The landcape surrounding the town is made of hills full of vines that give birth to world renonwed wines : Volnay, Montrachet or Meursault Premier Cru. From above, discover the perfectly aligned vines and dream of the grand cru you will taste in one of our local wineries after having seen the grapes there were made from. This beautiful region is an enchantment for the eyes in every season. Our pilot will show you the various aspects of the Pays Beaunois and detail the scenery while you sway to the rythm of the wind. If you wish to know how a flight goes, click here or here ! 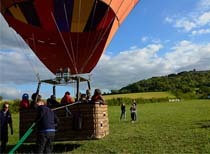 Here are the the most frequently asked questions about our balloon flights. To add a little extra with your gift, offer any one of our tickets in one of our elegant gift box.